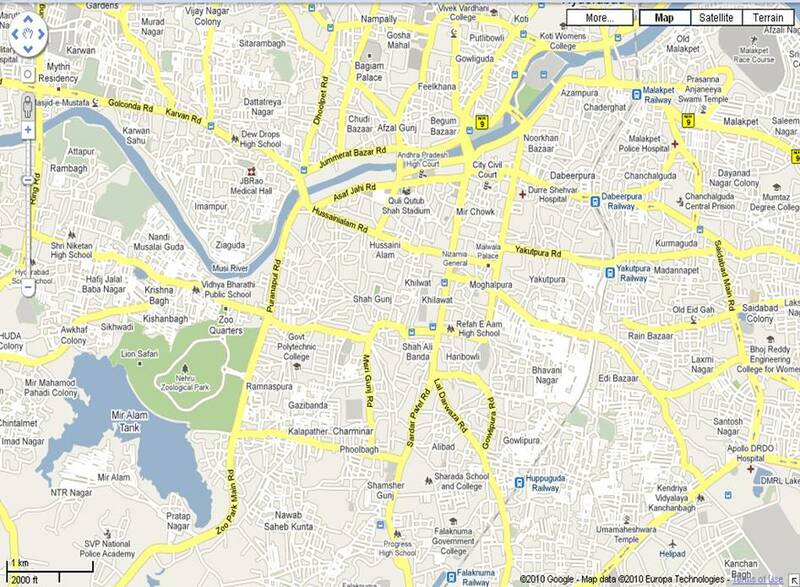 If the history of Hyderabad city starts before 400 years, this map shows the area where it all started. This Hyderabad map (Old City area) shows one of the earliest major cities in India. If you need to know how cities were about 200 years back, you can go to areas in this Hyderabad map and see for yourself. It provides fantastic understanding of the past. There are very few places that provide such perspective. In the areas covered by the Hyderabad Old city map, you can see historical monuments built in the best of architecture of that period by some of the wealthiest Kings in India. You get an understanding of town planning appropriate to the transportation of that time. Considering the roads were designed for the population of a few lakhs and pre-motor car/motorcycle era, you can then appreciate the width of the roads that were allowed. Considering the town planning of any ‘B’ and ‘C’ class town in modern India and compare with the old Hyderabad city, you will be surprised by the grandeur and the facilities provided in the city like markets, parks, gardens, public buildings and libraries. Muhammed Quli Qutub Shah of the Golconda Sultanate first founded his capital city on the southern banks of the Musi River in around early 1590s. He named it after his beloved wife Bhagmathi as Bhagyanagar or Bhagyanagaram. Bhagmati later embraced Islam and was awarded the title Hyder Mahal by the Sultan, for which the name of the city turns to Hyderabad. It was in 16th and 17th century that the city’s fortune picked up a pace, as it became one of the leading markets in the world for diamonds and pearls. Due to the city’s patronizing rulers, and the welcoming climate, Hyderabad soon became the hub of learning and trade. The old city was merely destroyed partially after the Aurangazeb invasions in 17th century and mostly after the devastating floods in 1908, after which the present development shifted to the present day twin cities. The entire old city has many historical monuments like mosques, palaces, temples, tombs, etc. Most of them are either under administration of Government or under protection of Archaeological Dept. of India. The ‘Purana Pul’ and the ‘Charminar’ are the major constructions that took place during the reign of Quli Qutub Shah. They stand strong even today, replicating the construction capabilities of Qutub Shahis. Other must see monuments are Mecca Masjid, Faluknama Palace and Chowmahalla palace. These are only few to name. Even the streets, eateries and markets serve as monuments and are famous tourist places here. Lad Bazaar or Chudi Bazaar, Shehran, Madina and Pather gatti near Charminar are replicas of the ancient business culture in Hyderabad. The Nehru Zoological park near Mir Alam tank is the largest in India. None known for standards of education to day, except for the historical buildings like Sultan-Ul-Oloom College near Charminar, etc. The world famous Pista House known for Haleem is based out of Hyderabad Old city. However, in old city we can find many Irani Hotels well known for their Irani Samosa, Irani Chai, Paaya and Biryani. Haleem is available too, but is seasonal. This entry was posted on Mar 2010 at 1:59 PM	and is filed under Hyderabad Maps. You can follow any responses to this entry through the RSS 2.0 feed. Your Feedback Matters!